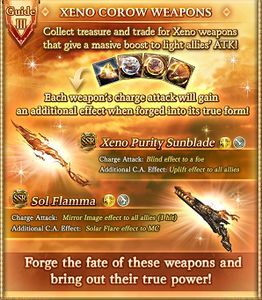 Xeno Corow Clash is a clash event that rewards items used to trade for the Xeno Purity Sunblade weapon. It is an expansion of Corow Showdown and the associated battles are also available during the event. 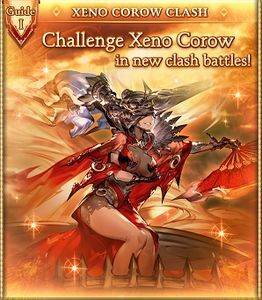 This event is fairly difficult for new players, with Xeno content being harder than the basic Showdown and extremely punishing for players without Dark teams. 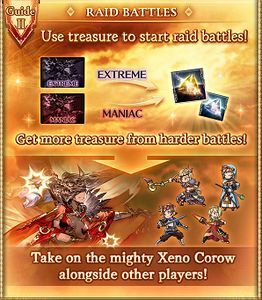 The normal Corow Showdown is also available, however, which can be used to gather most of the basic trade-in treasure for items from the Xeno event shop. Note that the inventory and material costs of the Xeno shop are separate from that of the normal Corow Showdown shop. 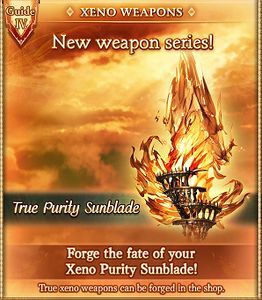 Xeno Purity Sunblade is one of the strongest Light EX weapons in the game. It fits perfectly into standard sword-focused Light Omega builds. As such, it is one of the most powerful Xeno weapons, alongside the Xeno Infernal Flamescythe and Xeno Judgement Lyre. It is strongly recommended that players with any interest in Light obtain at least one True Purity Sunblade. Obtaining enough copies to 4★ a Sunblade is a priority for HL-level players building Light grids. The sword has a particular value in Omega. Depending on your grid and party build, a second True Sunblade is worth it due to its excellent stats, sabre typing, EX multiplier, and synergy with Cosmic Sword BAL. See the Damage Formula page for more resources in determining if a second Sunblade will be beneficial to your build vs. the alternatives. For newer players, even one copy is an excellent addition to most grids or as a mainhand, and can feasibly be obtained by leeching the Event Raid or defeating NM70 a few times (if possible). Sunset Fan sees very niche use in primal grids. The frequency with which it drops in the event, however, makes it useful fodder for the Sunblade. Corow is an older summon, and somewhat displaced by the proliferation of Lucifer summons in the modern game. For newer players, Robomi Rocket from Robomi can be a better main summon option. See the Damage Formula page for more information on when to use a Corow main summon vs. a Luminiera Omega summon. Play Xeno Corow Clash and Corow Showdown at the same time! Clash battles are harder than showdowns. When you are able to clear extreme- or maniac-difficulty showdowns you should be able to take on Xeno Corow (Note that Xeno Corow's resistance to elements other than Dark is notably high, meaning this statement is more of a guideline than hard truth). Xeno Corow maniac-difficulty will unlock after clearing extreme-difficulty. Nightmare battles will appear at random after beating extreme or maniac battles. Xeno Corow has 50% damage resistance to all elements except for Dark. If unlucky, focus on maximizing the number of Flame Fanner and True Xeno Corow Anima received. Do both of the daily maniacs (Xeno and Old Corow). Do the highest Nightmare possible to maximize Flame Fanner drops. 0 AP ~1200 EP ~400 raids needed for the Flame Fanner. Sunlight Quartz 190 340 Enough will drop while just triggering NM. Halo Light Quartz 40 40 Save 40 for forging, use the rest liberally to host raids. Flame Fanner 45 80 Requires 12-25 NM120 or 35-60 NM70. Corow Anima 100 100 Enough will drop while just triggering NM. Corow Omega Anima 90 160 Farm extra EX/NM70 as necessary. Do the Maniacs. True Xeno Corow Anima 23 43 Leeching raid nets ~0.4 True Xeno Anima. 60% in red chests. Raid red chest can drop a Sabre. It's ~1.5% in the Host chest and ~0.5% in the MVP chest. While Extreme can drop a Sabre, it is very rare. However, the wiki staff does not have enough data on the Extreme drop rate to give a percentage. Estimated cost per Sabre is 2000 AP from raid and 2500-3000 AP from Extreme+NM70. Note that Drop Rate Boosts are very important for Extreme+NM70. Multi-hit Plain damage to random allies based on 10% of max HP. Removes 1 buff on all allies. Multi-hit Plain damage to random allies. On the next turn, it'll have 1 turns remaining. on one ally. Massive Light damage to all allies and removes 1 buff. Normal attacks hit all allies until 45%. Massive Light damage to all allies. 15-hit Plain damage to random allies based on 10% of max HP. Cost to Host: 0 AP Unlock: May appear after clearing Xeno Corow Extreme. Guaranteed to appear after clearing Xeno Corow Maniac. Cost to Host: 0 AP Unlock: Clear Xeno Corow Nightmare Level 70. May appear after clearing Xeno Corow Extreme. Guaranteed to appear after clearing Xeno Corow Maniac. Cost to Host: 0 AP Unlock: Clear Xeno Corow Nightmare Level 100. May appear after clearing Xeno Corow Extreme. Guaranteed to appear after clearing Xeno Corow Maniac. Massive Light damage to all allies and removes 3 buffs. This page was last modified on 28 December 2018, at 06:44.